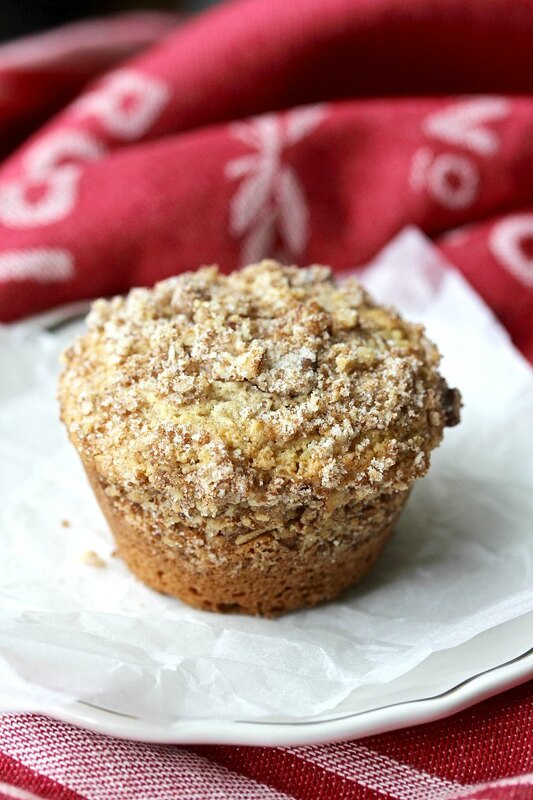 Coffee Cake Muffins with cinnamon, pecans, and streusel, all of the flavors from your favorite coffee cake in a portable muffin. 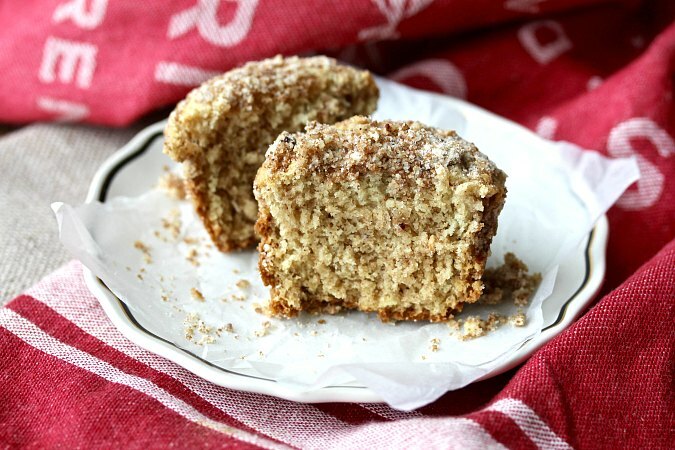 These coffee cake muffins are both topped with and filled with a cinnamon, brown sugar, and pecan streusel. 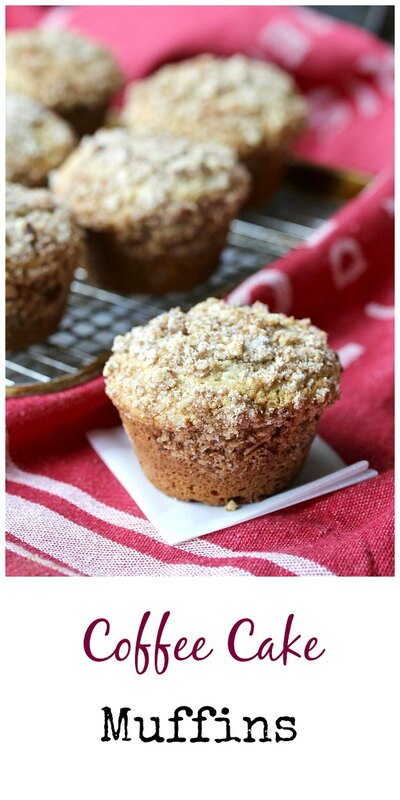 These muffins are so easy to make in your food processor and they are reminiscent of your favorite comfort food coffee cake. I've been on a streusel kick lately. 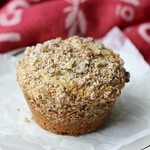 There's something about streusel that makes a sweet muffin taste even better. Last month I made these peanut butter and jelly muffins with a peanut streusel, and the month before, I put an oat streusel on these butternut squash and apple muffins. It all began when I made these Bouchon Bakery style carrot muffins where I made way too much streusel and put the leftovers in the freezer. It turns out that freezing extra streusel is amazingly convenient and saves so much time in the long run. For these muffins, I made a fresh batch of streusel. Some of it is reserved for topping the muffins, and a lot of it actually goes in the muffin batter. 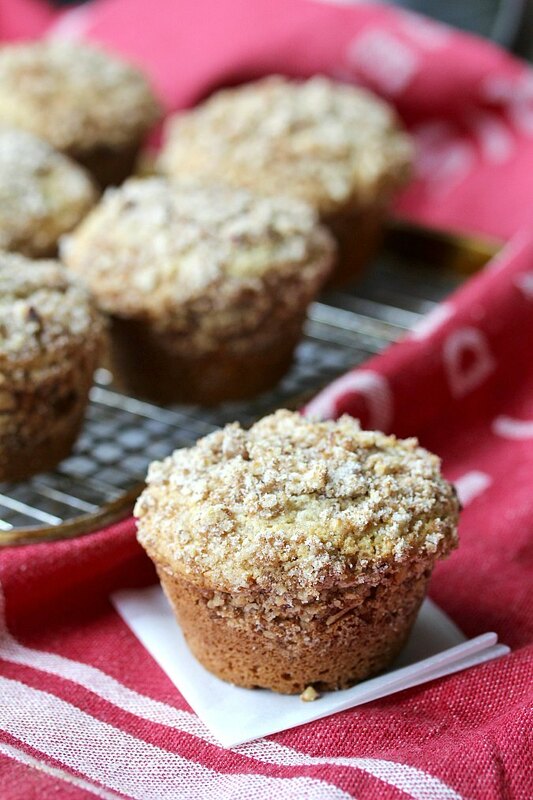 These coffee cake muffins are wonderful for breakfast or a snack, and they stay pretty fresh for up to three days when kept in an airtight container. You can also wrap the cooled muffins individually in plastic wrap and freeze them for up to a month in a freezer bag. By the way, even my nut hating family members loved these! 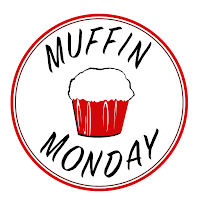 After the recipe, be sure to check out the selection of muffin recipes from my Muffin Monday friends, organized by Stacy of Food Lust People Love. Heat your oven to 350 degrees F with a rack in the middle. Spray a 12 cup muffin tin with spray oil. In the bowl of a food processor, pulse the nuts, brown sugar, and cinnamon in about 10 one-second bursts. Transfer the mixture to a medium bowl. Add the flour, granulated sugar, and salt to the food processor, and pulse about 5 to 6 times, until combined. Scatter the butter over the flour mixture and pulse until the butter looks like oats, about 8 pulses one second long each. Measure one cup of the flour and butter mixture, add it to the pecan and brown sugar mixture, and stir to make the streusel. Measure 3/4 cup of the streusel and set aside to add back into the batter. Add the baking powder and baking soda to the remaining flour mixture in the food processor. Process with about 5 one second bursts, to combine. In a small bowl, whisk together the sour cream, egg, and vanilla, and add it to the food processor. Pulse with the food processor until just combined into the flour, about 5 pulses. Add the 3/4 cup of the previously set aside streusel back into the food processor and pulse about 5 times, until just combined. It's okay if it looks a little streaky. The batter will be very thick. Divide the batter evenly among ten of the muffin cups. Top with the streusel left in the bowl, and gently press it into the tops of the muffins. Bake the muffins for about 18 minutes, rotating the pan halfway through. A toothpick inserted in the middle should come out clean. Cool the muffins in the pan on a wire rack for 2 minutes, and then remove them from the pan to continue cooling on the rack. Cool at least 5 more minutes before serving. Portable coffee cake, you say? What a great idea for a coffee or tea party, Karen! Who can resist streusel? Thanks Stacy =) Definitely not me! These sound wonderful Karen. I think my reno crew will be happy to see these this week on their coffee break. Oh I do think they would too! Innovative idea of making coffee muffins. Looks amazing.